Master Bedroom - Bathroom, upload feito originalmente por Jeremy Levine Design. Instead of enclosing the master bathroom, it became part of the main room, defined by the Quartzite stone tile on the walls. 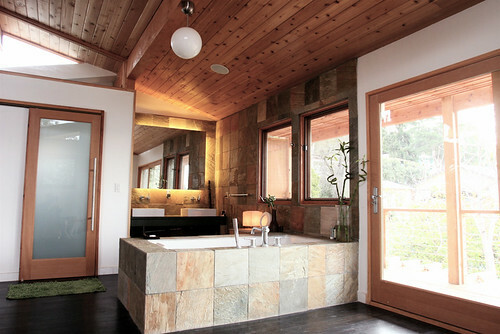 The large stone clad tub sits in the room like a throne, poised by a window to view the hills or to allow one to kick back and gaze up at the big roof overhead. The w/c is concealed behind a sliding white glass door. In order to avoid feeling like a closet, the space is vaulted to the ceiling and flooded with light from clerestory windows at the top of the walls.